At The Orthopedic Clinic, we individualize the treatment plan to your needs to provide the best care possible for you. Our goal is always to provide treatment that balances the fastest recovery possible with our patients’ overall health and wellbeing. Why Choose Our Foot and Ankle Specialists? What Do the Foot and Ankle Do? The ankle plays a major role in the overall movement, allowing you to walk, run, and jump. An injury to either the foot or ankle can greatly impact your movement and quality of life. 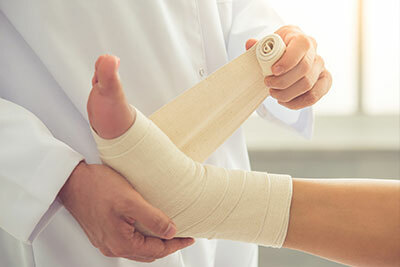 Fracture care treatment depends on the injury to the foot or ankle. Visit our fracture care page to learn more about our treatment options. We provide both surgical and non-surgical treatment options for foot and ankle sprains. At The Orthopedic Clinic, we believe that surgery can be an effective option, but needs to be agreed upon by the physician and patient after other treatments haven’t helped. An ankle fusion is a surgical procedure that is usually done when an ankle joint becomes worn out and painful. We remove the surfaces of the ankle joint and allow the tibia to grow together, or fuse, with the talus. A fusion keeps the ankle joint from moving during walking and other activities, so the other foot joints will need good mobility. There are several techniques to repair an injured Achilles tendon. We’ll individualize our approach to your needs. We typically perform this procedure in an outpatient setting so you spend minimal time in the hospital. A condition common in athletes, the procedure to repair this involves making a small incision to remove the injured tendon, repairing it, and re-inserting it through the incision. We perform both surgical and non-surgical procedures to repair injured peroneal tendons. The best treatment depends on your needs. We’ll individualize the treatment plan to you. We perform both surgical and non-surgical procedures to repair bunions and hammer toes. The best treatment depends on your needs. We’ll individualize the treatment plan to you. Do Your Feet or Ankles Hurt? We Can Help! Our dependable orthopedic specialists treat foot and ankle problems every day. We can help you determine the source of your pain to create a custom treatment plan for your needs, so you can get back to the things you love to do.